I just realized I haven’t shared this skin-saving balm that I’m loving. 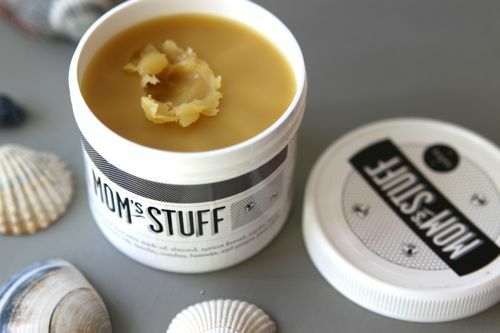 In July, I bought a jar of Mom’s Stuff salve and have found it to be so all-around useful! I use it on my dry summer feet (especially the heels), on my hands after doing the dishes, and use it to sooth and heal the kids’ bumps and scrapes. It works wonders, I swear. It’s one of those products that has become a part of the family bag — thrown in with diapers, sunscreen, water bottles, etc. when we head off on an adventure. I always like trying a new product, and I was tempted by this one because it’s carefully made in small batches by one person (her name is Lee Bennion), plus the ingredients are as wholesome as can be. I love discovering products like that! Any good beauty balms you’ve tried lately? P.S. — A little goes a long way, so it looks like my one jar is going to last for ages! This looks great! I’ll have to put it on my wish list! Thanks for sharing. I will be ordering some, I have really dry skin and I’m always on the lookout for natural products. I love coconut oil but this should be even better, specially with winter coming up. I was thinking the same thing, Giselle. I bet this will be wonderful for my winter hands — my knuckles has such a tendency to chap. I actually make my own herbal healing salve and am in the process of having it branded and sold locally. There is nothing so wonderful as making something by hand and watching it work its magic for my friends and family! Love Lee Bennion’s site and wish her the very best with her product! Looks just like a balm that The Good Home Co used to make, also in small batches. I’m intrigued about the smell…Pinion pine pitch? Hmmm, just gonna have to try it! Great rec! The scent is strong and herbal-y. It’s the kind of scent that assures me the product is going to be effective! I’m definitely going to give it a try! My mom always had this jar of random salve she used on everything. There was no brand name or identifier to be able to buy more (not that we needed it because the jar lasted forever!). But I’m anxious to try this for my eczema and dry skin. 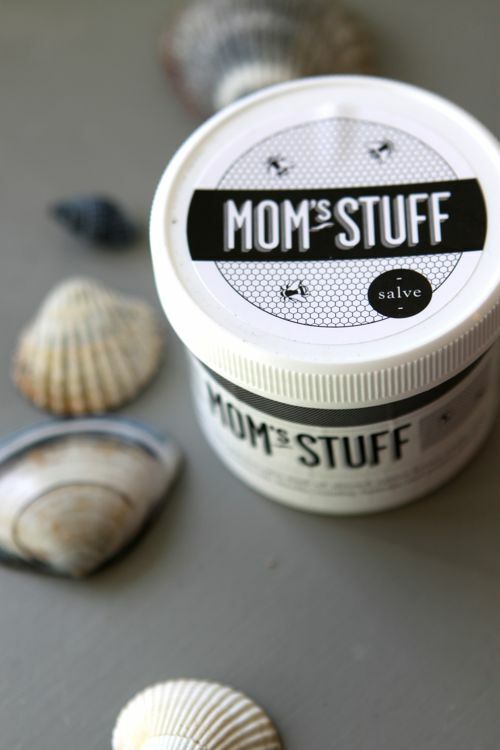 Best part is the name – Mom’s Stuff… because that’s just what we called my mom’s salve. Thanks for sharing! Angie, Lots of people have told me that my salve reminds them of salves that their Grandmother’s made. A hundred years ago salves were more common than lotion and many folks made their own. Because of this I also claim that Mom’s Stuff is a Time Machine as it takes older people back to their childhoods when they open the jar, smell it and then put it on. Oh, thank you! My heels were sooo dry this summer! I don’t know what the deal was! I would put oil on at night then socks then I would get too hot and peel them off in the middle of the night! This looks like it has some bee’s wax in it? LOTS of Bees wax in it Ann. lee and joe are my dearest family members – super lee and papa joe – and i can promise you this salve is made with lo-o-o-o-ve. my bennion pride-o-meter is beaming higher than normal this morning. You make me blush Aubry! I make my own too. I use it on everything from dry skin around my eyes (it’s totally gotten rid of my fine lines) to eczema on my kid arms. Lee is also one of my favorite artists–such feeling and love in her work. Thank you Peggy- Where have you seen my paintings? Lee Udall Bennion, *the* Lee Udall Bennion? This is like when my family took a trip to Disneyland and we saw Jay Leno outside a bar and he waved at us when we honked. I had to do a quick google to find out if it really was the artist! I thought for sure it had to be a mistake, same name, different person. Ah, she just got cooler in my book! I have seen plenty of her paintings, mostly in and around Utah County but also as subjects in art classes. So neat! Thank-you Gabrielle for sharing Mom’s Stuff with your fans. It has been a long wonderful day of filling orders for me (Mom). I hope all of you who have ordered will love it as much as Gabrielle and want to share it with your family and friends. If any of you have questions, head to my website and read about the ingredients or read what my customers say about the many different ways it helps them on the endorsement page, or feel free to email me!